-- volcano -- Aag Akademia Nauk Akhtang Alaid Alney-Chashakondzha Alngey Anaun Arik Arkhangelsky Ridge (6.12b) Arkhangelsky Ridge (6.12а) Asacha Atsonupuri Avachinsky Avos Crags Bakening Baransky Barkhatnaya Sopka Belenkaya Bely Belyankin Berg Berg (7.6) Berutarube Bezymianny Bliznets Bliznetsy Bogdan Khmelnitskii Bolshaya Udina Bolshoi Bolshoi Payalpan Bolshoi Semiachik Borzov Brat Chirpoev Broughton Ridge (6.5a) Broughton Ridge (6.5b) Broughton Ridge (6.5c) Caldera Gorshkova Cherny Cherpuk Group Chikurachki Chirinkotan Chyornogo Demon Diky Greben Dzenzursky Ebeko Edelstein (3.1a) Edelstein (3.1b) Eggella Ekarma Elovsky Fedotych Fuss Peak Gamchen Geodesistov Golaya Golets-Tornyi Group Golovnin Gorely Goriaschaia Sopka Gorny Institute Gorshkov Сaldera (6.11b) Grigoriev Ichinsky Iettunup Iliinsky Itktunup Ivan Grozny Ivao Group Kaileney Kambalny Kamen Karpinsky Karymsky Kebeney Kekuknaysky Kekurny Kell Khangar Kharchinsky Khodutka Kikhpinych Kinenin Kizimen Klyuchevskoy Kolokol Komarov Koryaksky Koshelev Kostakan Kozelsky Kozyrevsky Krainy Krasheninnikov Krenitzyn Peak Krestovsky Kronotsky Krylatka Ksudach Kudryavy Kulkev Kuntomintar Kupol Kurile Lake Leutongey Lisiansky Lomonosov Group Lovushki Crags Lvinaya Past Makarov Malaya Udina Maly Payalpan Maly Semyachik Mashkovtsev Medvezhii Mendeleev Mezhdusopochny Milne Mironov Mutnovsky Nemo Peak Nikolka Nylgimelkin Obruchev Olkoviy Volc Group Opala Ostanets Ostry Ostry Tolbachik Otdelniy Ozernoy Pallas Peak Pegas Piip Piratkovsky Plosky Plosky 2 Plosky Tolbachik Pogranychny Prevo Peak Raikoke Rasshua Ratmanov Rikord Romanovka Rudakov Sarychev Peak Schmidt Sedankinsky Severgin Severny Sheveluch Shirinki Shisheika Shishel Sinarka Smirnov Smirnov (2.2) Snegovoy Snezhniy Snow Spokoiny Srednii Srednii isl. Stokap Tao-Rusyr Caldera Tatarinov Taunshits Tebenkov Terpuk Tiatia Titila Tolmachev Dol Trezubetz Tri Sestry Tuzovsky Uka Uksichan Unnamed 2 Unnamed 3 Unnamed 4 Unnamed 5 Unnamed 6 Unnamed 7 Unnamed 8 Unnamed 9 Uratman Ushishir Ushkovsky Uzon Vavilov (6.6) Vavilov (6.7) Vavilov (6.8) Veer Verkhovoy Vernadskii Ridge Viliuchinsky Visokiy 2 Voyampolsky Vysoky Yavinsky Yubileyny Zaozerny Zarechny Zavaritsky Zavaritzki Caldera Zheltovsky Zhupanovsky Zimina 1.2 1.3 1.4 1.5 1.6 1.7 2.4 2.5 2.6 2.7 2.8 3.10 3.12 3.13 3.14 3.15 3.16 3.17 3.18 3.19 3.2 3.20 3.3 3.4 3.5 3.8 3.9 4.1 4.2 4.3 4.4 5.2 5.3 5.5 6.10 6.13 6.14 6.3 6.4 6.9 7.1 7.10 7.11a 7.11b 7.11c 7.12 7.13b 7.13а 7.14a 7.14b 7.15 7.16 7.19 7.2 7.20 7.3 7.4 7.5 7.7 7.8 7.9 8.1 8.10 8.11 8.12 8.13 8.14 8.15 8.16 8.17 8.18 8.19 8.2 8.20 8.3 8.5 8.6 8.7 8.8 8.9 -- year -- 2019 2018 2017 2016 2015 2014 2013 2012 2011 2010 2009 2008 2007 2006 2005 2004 2003 2002 2001 2000 1999 1998 1997 1996 1994 1993 1991 1990 1989 1988 1987 1985 1981 1980 1976 1975 1974 1973 1972 1970 1969 1967 1964 1963 1959 1957 1956 1952 1946 ? 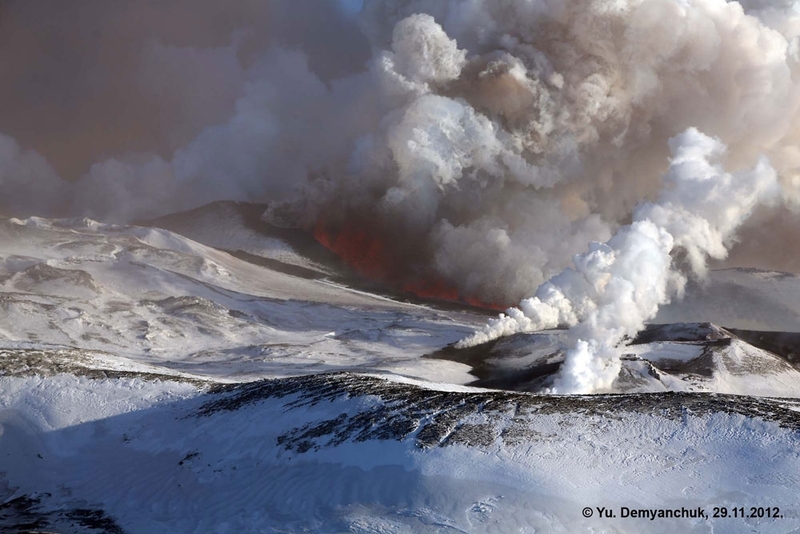 Lava flows from two vents effuse to the west side of Tolbachinsky Dol. 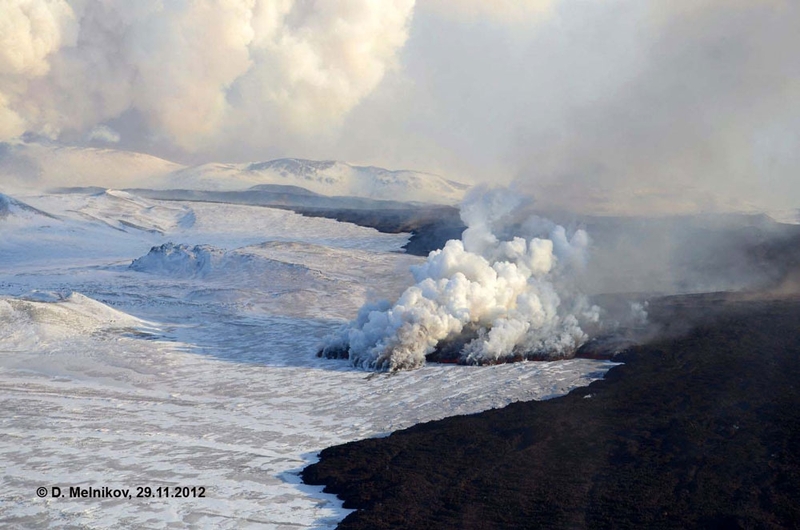 Front of the lava flow from Southern fissure, its length is about 4 km. Small portion of lava. Probably there is basalts of the subalkaline aluminous type. Southern fissure and its lava flow. 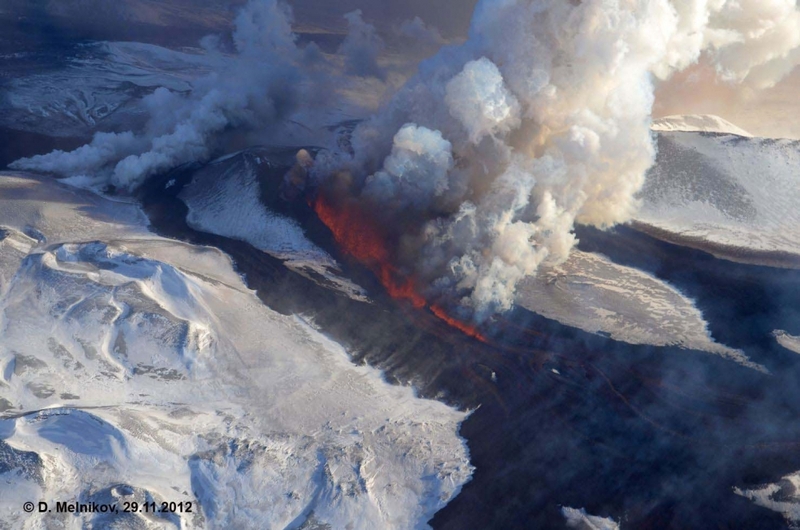 Southern fissure to cut through cone Krasny. Lava fountain into the fissure and an essusion of lava flow. Probably lava flows from Northern fissure border cone Krasny. Lava flow of the Southern fissure. 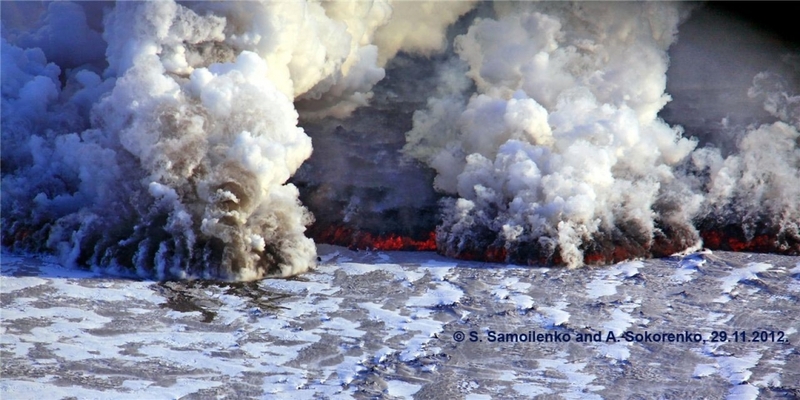 Southern fissure: a lava fountains and ash explosions; an effusion of lava flow. 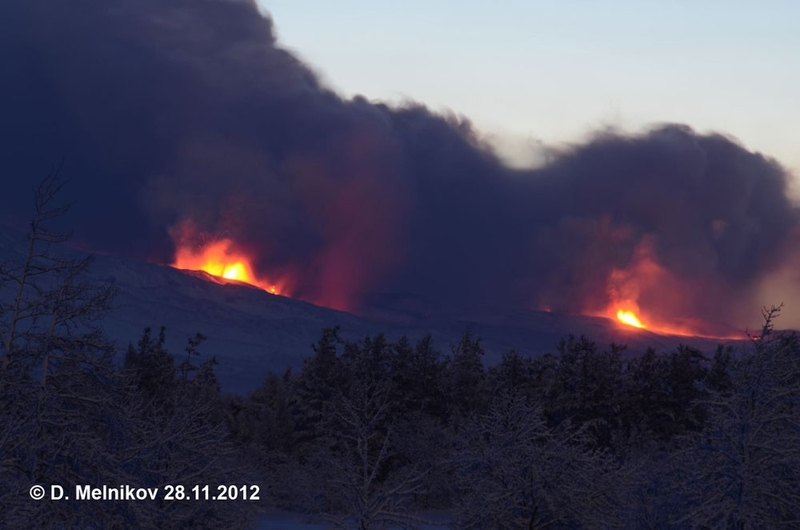 Gas-steam plumes from fronts of lava flow portions. 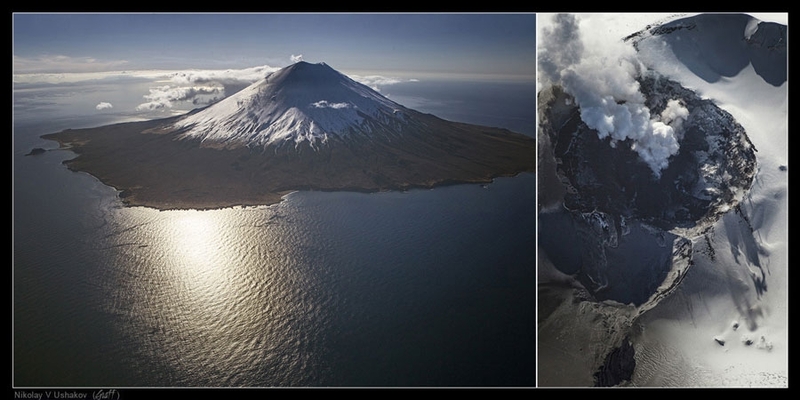 Lava flow from Southern fissure covered Stationar "Leningradskaya" of IVS FED RAS and Visitor Centre of Nature Park “Volcanoes of Kamchatka” (arrow). 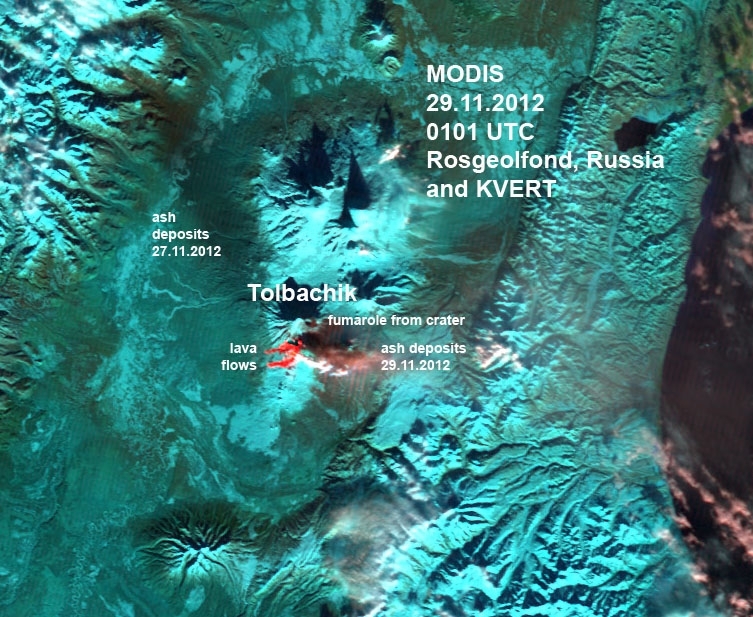 Satellite image MODIS of Klyuchevskaya volcanic group, Kamchatka, 29.11.2012. 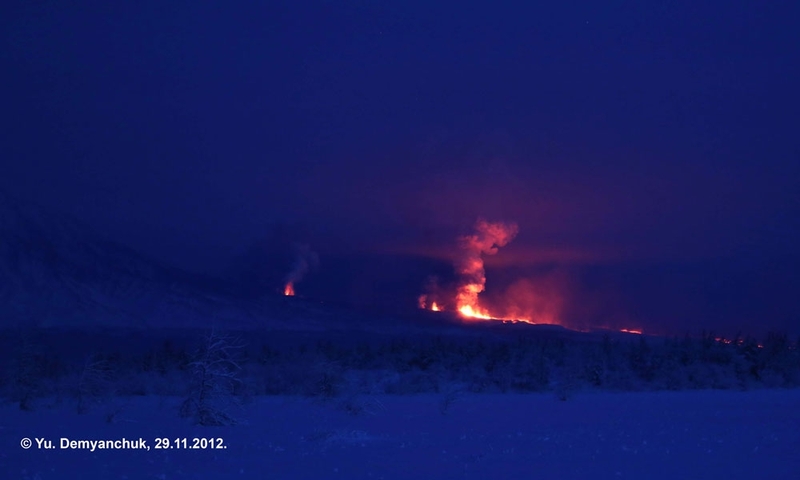 Fissure eruption on Tolbachinsky Dol continues. 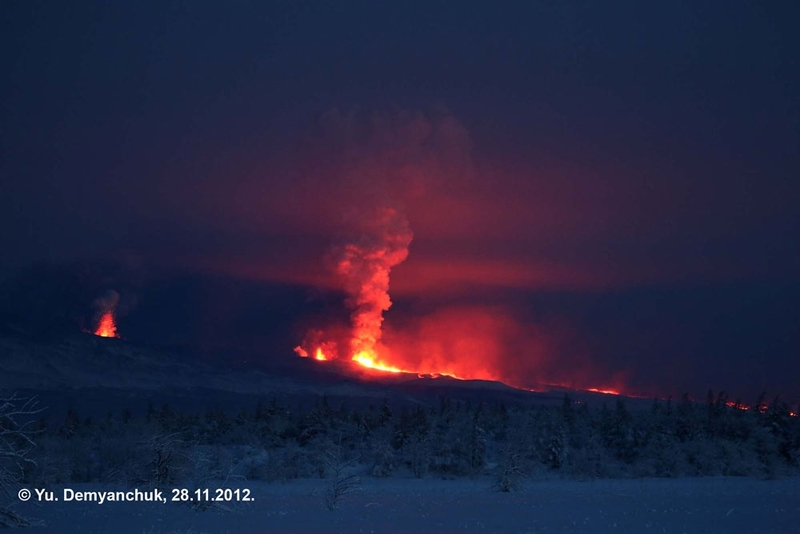 Fumarole activity of the volcano on November 29, 2012. 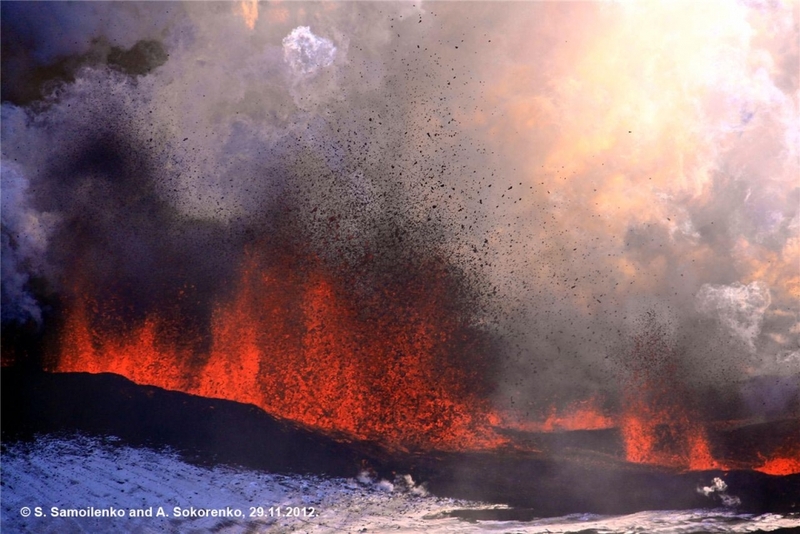 Strombolian activity at the Southern fissure, 2012 eruption at Tolbachinsky Dol. Lava is coming! 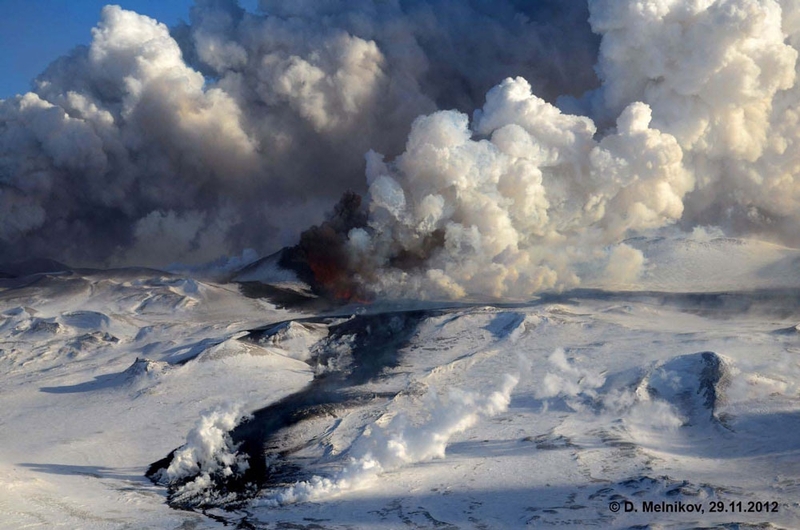 Tolbachinsky Dol, 2012 eruption. 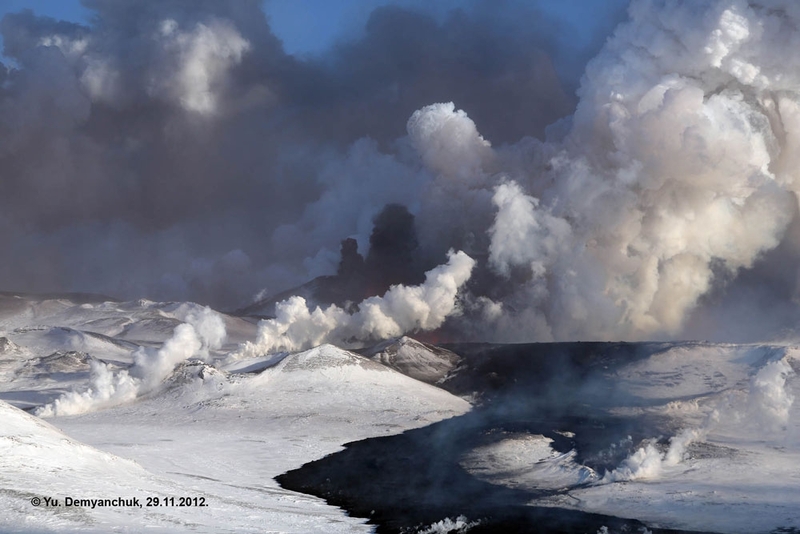 Two fissures and Strombolian activity at the Tolbachinsky Dol - southern Plosky Tolbachik. 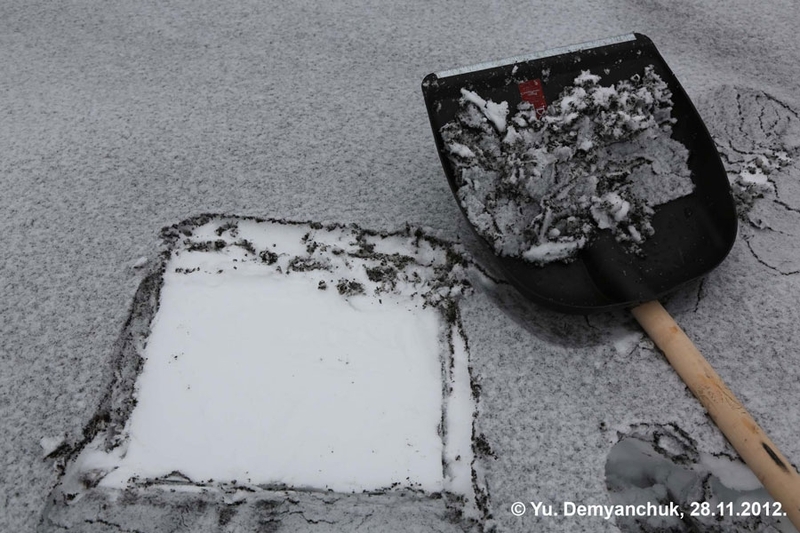 Ash plumes raise up to 3 km a.sl. and are extending to the north. 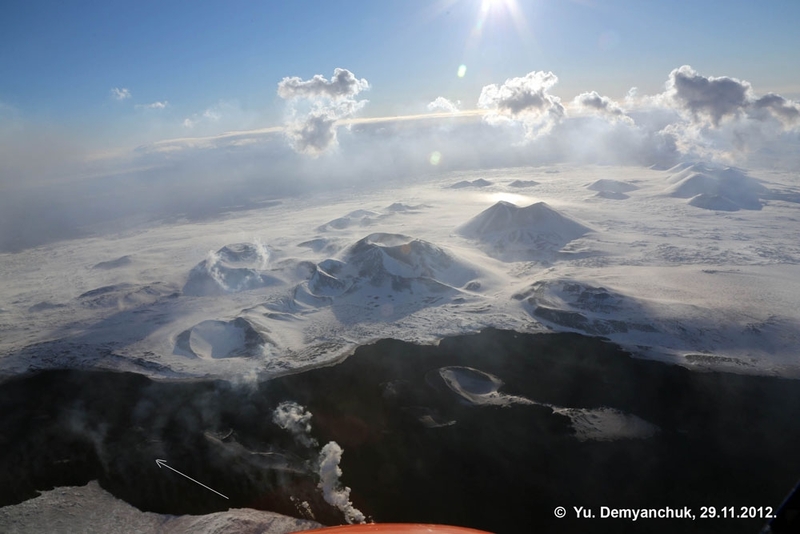 Two fissures and Strombolian activity at the Tolbachinsky Dol - southern Plosky Tolbachik. 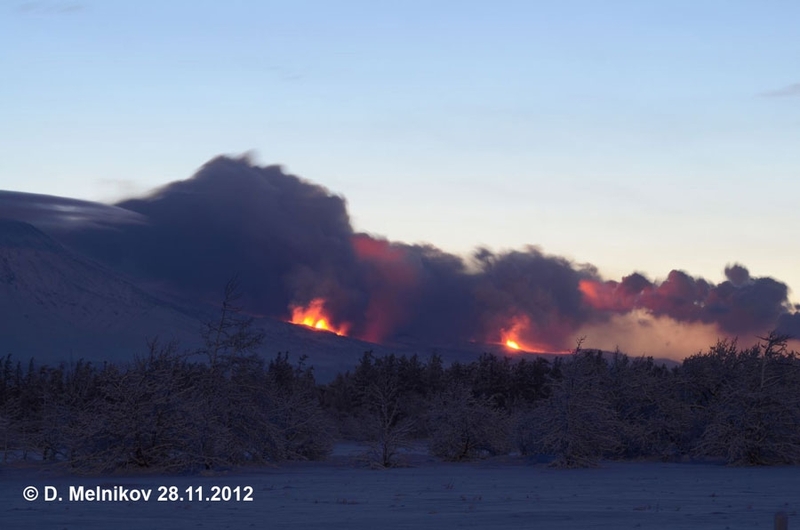 Ash plumes raise up to 3 km a.s.l. 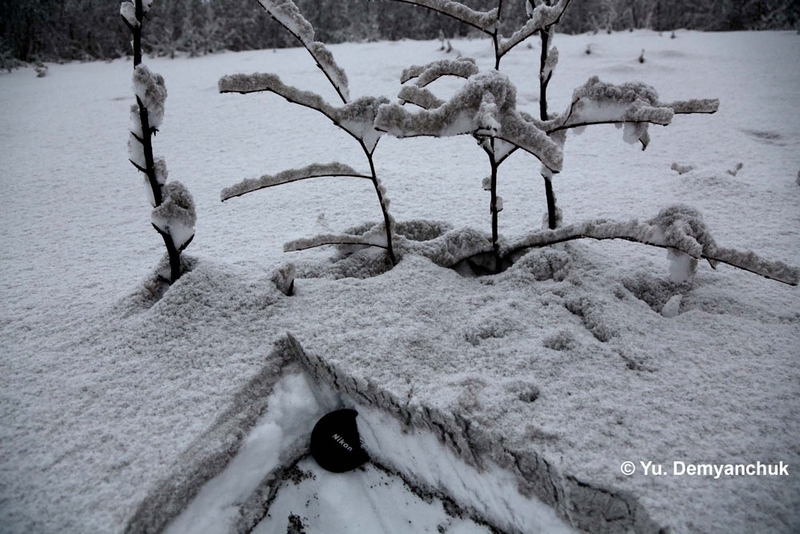 Ash deposits of Tolbachik volcano near Krasny Yar. 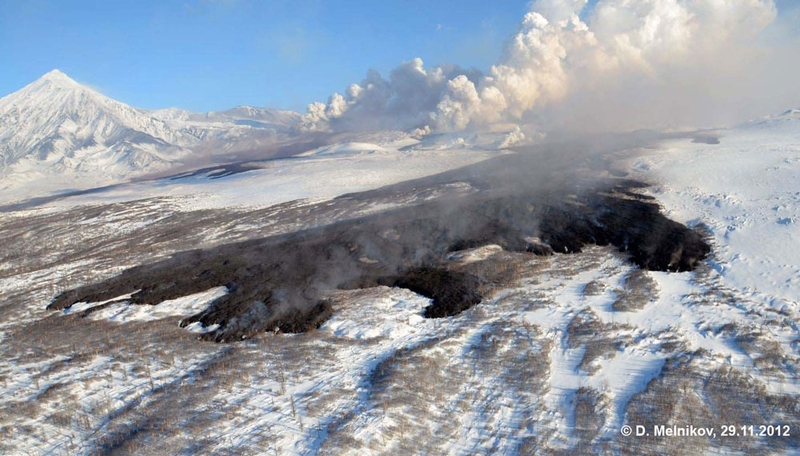 Fresh ash of Tolbachik volcano. 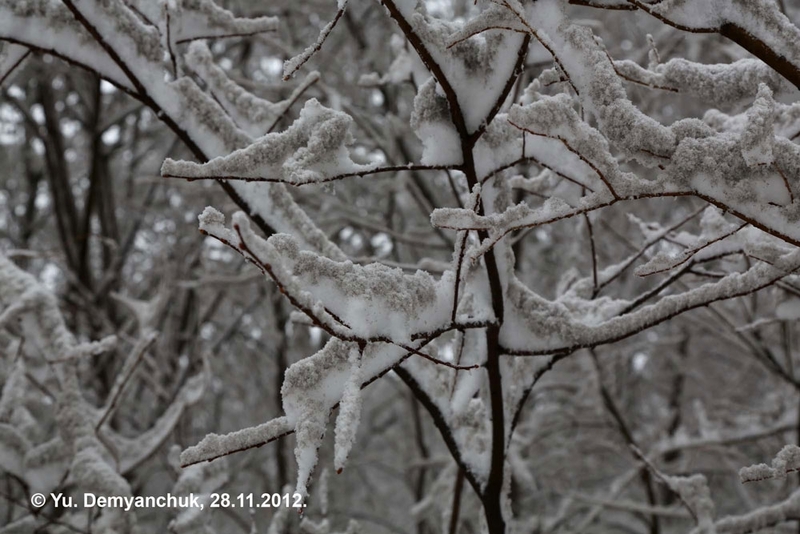 Ash deposits of Tolbachik volcano on November 28, 2012. 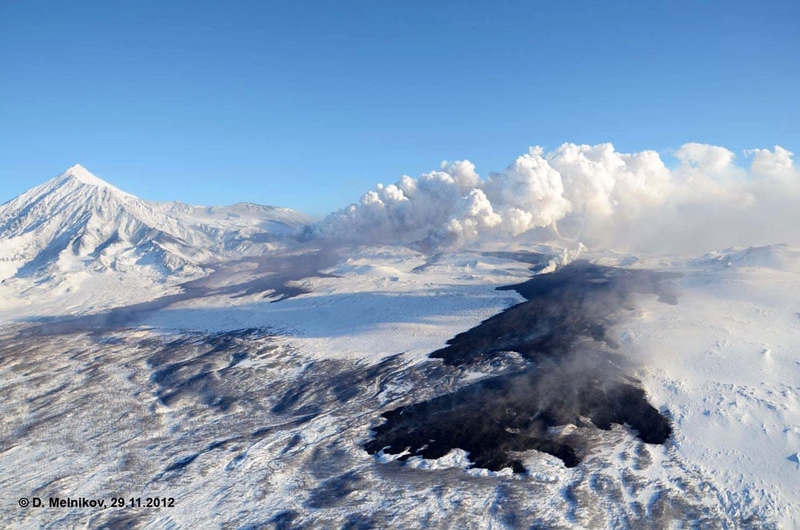 Activity of Southern fissure of 2012 eruption. Strombolian activity and lava flows effusive. 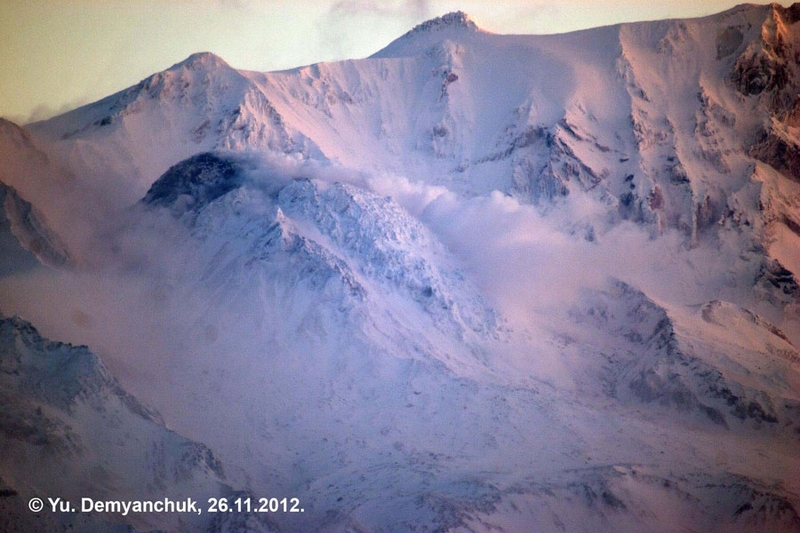 Lava Dome of Sheveluch volcano on November 26, 2012. 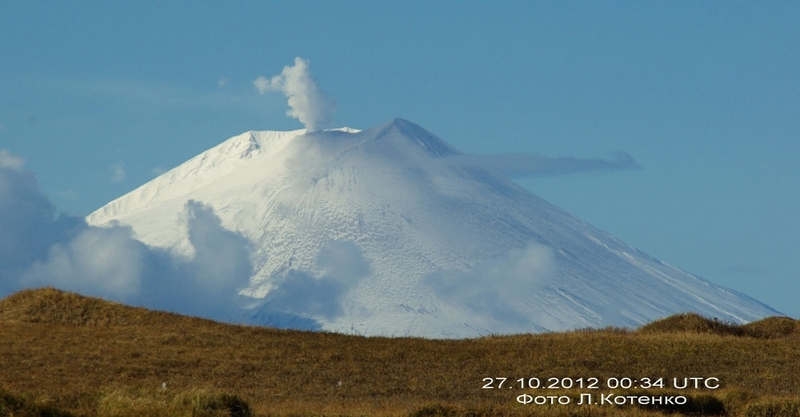 Fumarole activity of Alaid volcano 27.10.2012. 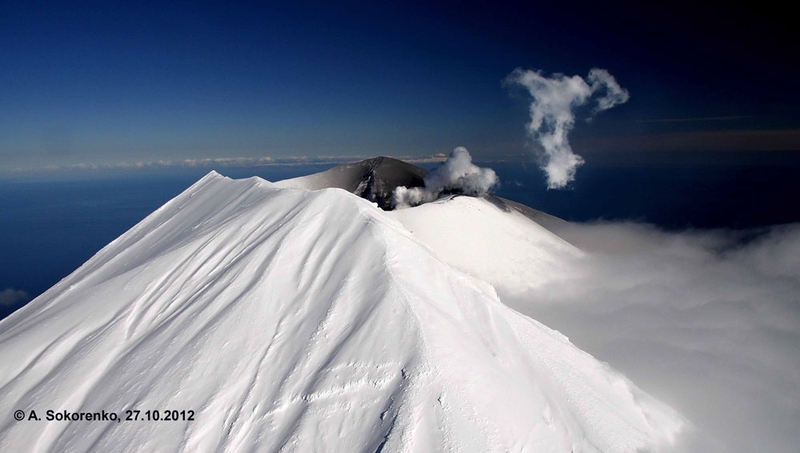 Fumarole activity of Alaid volcano on October 27, 2012. Recommended browsers for viewing this site: Google Chrome, Mozilla Firefox, Opera, Yandex. Using another browser may cause incorrect browsing of webpages. No part of the Geoportal and/or Geoportal content can be reproduced in any form whether electronically or otherwise without the prior consent of the copyright holder. You must provide a link to the Geoportal geoportal.kscnet.ru from your own website.